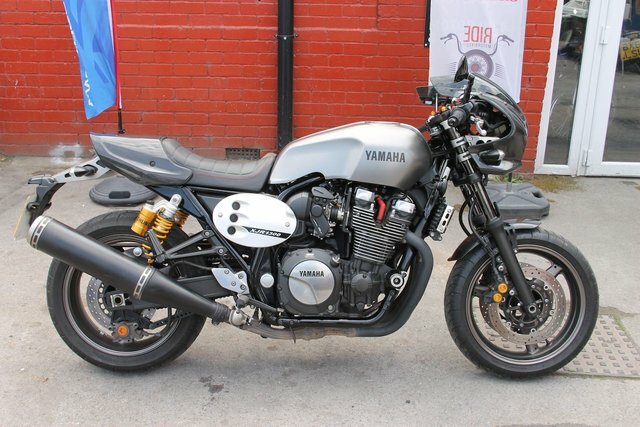 Here we have a Yamaha XJR 1300 60th Anniversary Cafe Racer with only 5.6k on the clock. Finance available. Credit and Debit cards accepted. The bike will leave us with a full PDI, interim service and a 3 mth warranty. Extended nationwide warranties are available at low prices. The first MOT isn't due until Feb 2019. The bike benefits from Carbon trim, Ohlin suspension, Crash bungs, all its keys and booklets and the V5 is present. There are really some nice design touches on the bike and it certainly stands out from the crowd of normal muscle bikes. Ride is a friendly down to earth business with a passion for biking. Nationwide Delivery, HPI Clear, PX Welcome, Friendly Customer Service. 01535 658811 ***Check out our customer reviews on the website, at Ride Motorbikes Ltd Facebook page/Autotrader shop and google*** For more information about us, the bike and our stock please visit our website. The adventure starts here! Open 7 Days A Week Ask us about Locks and Chains, Datatags, Helmets and Heated Grips. Stay warm and secure with Ride.